If you are anything like me (and why wouldn't you be), you had surely marked down, highlighted and circled in bright red marker the date for pre-ordering Inara's Rainbow. And, unless you are living in a world without calendars (which I suppose is entirely possible), you may have also noticed that the date which I shared with you has passed. Are you confused? Saddened? Tormented? Couldn't care less? Well fie on you, then. The scoop is that Giselle, who is exclusively running the pre-order through her store, Piece of Cloth, had a very busy (in a good way! Yay for Giselle!) Black Friday and needed a little bit of extra time to deal with all the important things she does to keep tons of customers happy at any given moment. I honestly don't know how she does it all. I want to clone her to run my brain for a day. I bet I'd become super productive and have a permanent smile affixed to my face...but I digress! Giselle emailed me to let me know that there would be a slight delay on opening up the pre-order and honestly, that was okay. In fact, I was already cooking up a little side-project to make the wait a little more bearable...and I was absolutely delighted when all the pieces started falling into place. What happened was this: as the date for the pre-order got closer, I started to get really excited about how so many people were getting to share in the Inara's Rainbow story. I got to read tons of emails from so many of you - some of you shared in my joy and anticipation, some of you offered kind words of support for everything we had been through, and all of you touched me. I wanted to do MORE for this wonderful community of babywearers, especially for those of you that told me that you loved the idea of the wrap, but weren't sure that you could afford (or didn't need) a baby carrier right now. I know things are tight with the economy, and especially with the holidays coming up, so I started thinking about how we could make Inara's Rainbow more accessible to people - and that's when the idea for the teething giraffes popped into my head. 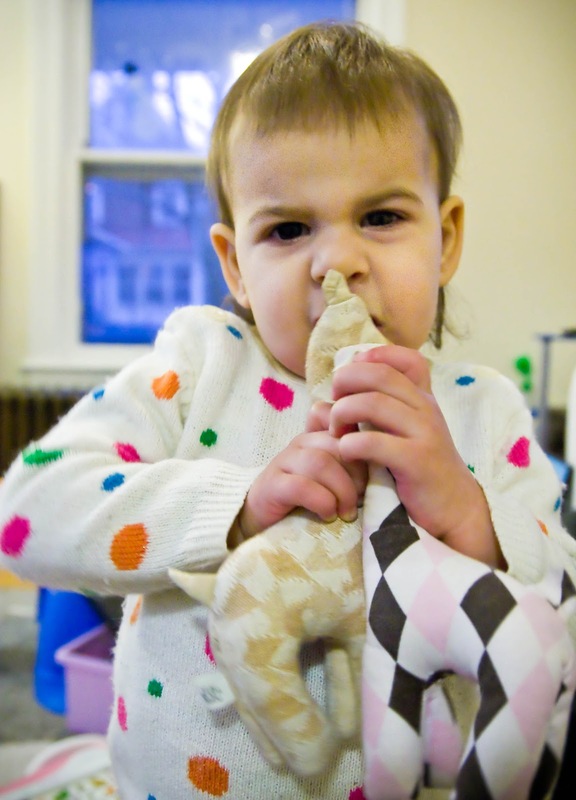 By now you have heard me gush endlessly about my very dear friend Suzi, who is the creator behind the insanely popular Starbright Baby Teething Giraffe (See that gorgeous banner? Guess who took that picture? I'll give you a hint. It was ME! And see that adorable baby? That's my friend Jen's daughter! Our wee ones were Suzi's first testers way back in the day!!! Hooray for talented friends!). Well, I begged casually asked her if she'd be up for creating some limited-edition Inara's Rainbow teething giraffes, and guess what? She said YES!!!!!! After that it was easy-peasy to introduce Suzi and Giselle to one another so that they could work out the details. All I had to do was sit back and bask in the glow of rainbowy-goodness, because I just knew that putting these two amazing and talented women together would lead to beautiful things. So here's how it's going to work - you can now find a listing on the Starbright Baby Etsy shop to Preorder an Inara's Rainbow Teething Giraffe. You can visit that link to see the details about the pre-order (or visit the Starbright Baby Facebook page). If you have any other questions, please kindly direct them to Suzi...I don't really know how business things work, I just like pretty rainbowy products! I am really excited about this collaboration between Starbright Baby and Piece of Cloth. First of all because it joins two of my most favorite people, but also because I feel like we are making Inara's Rainbow a reality for so many MORE people than I ever dreamed possible. For those of you that told me how you really wanted to be a part of this but weren't sure how...this is your chance. I hope Inara's Rainbow can be a part of your life in some small way! Ouch. That looks like it would be painful. 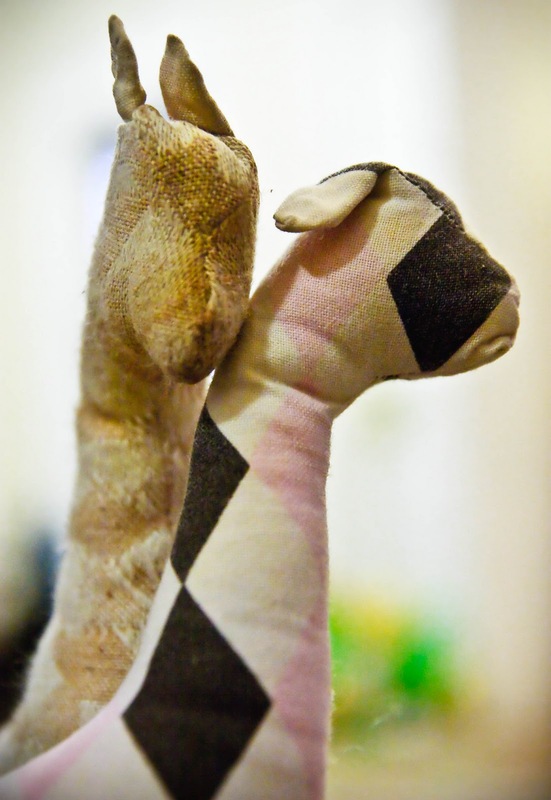 These giraffes really are wonderful toys. You can tell that they are beautifully made - all by hand. Ours are lovingly worn but they are still favorite treasures of both girls. I hope that you will get a chance to enjoy them too. But I can't tell you about it yet! Eeeeeeeek!!! I'm so excited about this next part that I think I'm going to die from the anticipation. I reallyreallyreallyreally want to give you a hint. About this next thing. Which will also be a part of the Inara's Rainbow story. ACK I NEED TO STOP RIGHT NOW. Stay tuned, friends!! I promised that I would wait until after the pre-order opens to spill the beans....so I guess you'll just have to wait too. Stop throwing those tomatoes!! I know that it's going to be so hard to wait, but it won't be for much longer. I just saw a message from Giselle and it says that the pre-order is going to open TONIGHT (late tonight so really more like tomorrow, she said)! Woo hoo! Ladies and gentlemen, let the countdown begin! Polish off your plastic and get that mouse finger ready! Inara's Rainbow is GOOD TO GO! For the latest details about the Inara's Rainbow pre-order, don't forget to bookmark the Nurture Baby Naturally Facebook page. I will also be posting updates at my Facebook page as I get them, as well as with the #InarasRainbow hashtag on Twitter. So now you have lots of ways to stalk Inara's Rainbow! Rejoice!